Knitting is definitely out of the doldrums and making headway with aÂ stiff breeze behind it. The breeze in this case being the impetus of the 20th July deadline for the Colourmart Lovers competition bash. We have three real WIPs for disclosure this week. Yes, I really am working (hard) on three concurrent projects. My Jubilee cardigan is turning out to be very slow and difficult work indeed. The yarn is inelastic and quite harsh on the hands and the whole piece is unwieldy and heavy – making for a strain on my wrists. I cannot bash away at this simple stocking stitch piece in the way that I had anticipated. It seems likely that it will be a UFO at 20th July. The photo was taken last night. 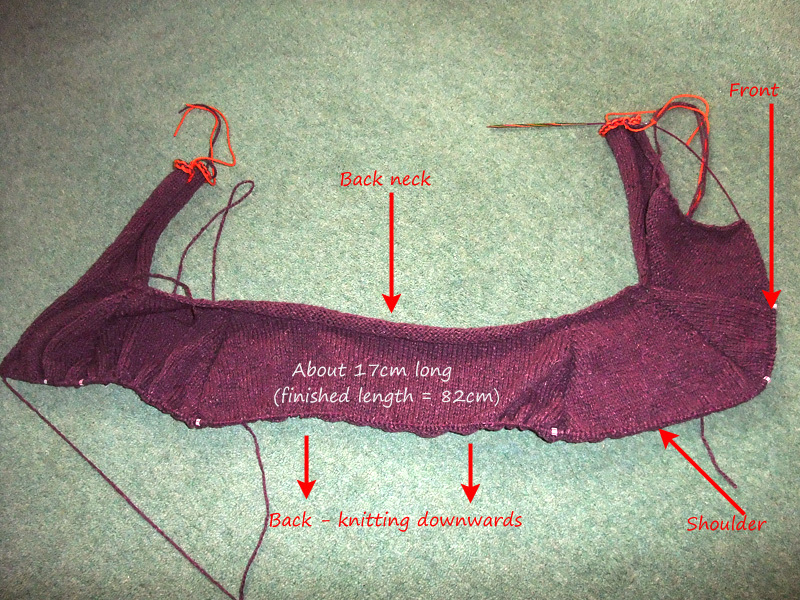 I’m not down to the armholes yet – there’s an awful long way to go before it is completed. I won’t give up. The finished object will be worth all the hard work. Plus, I really need a new everyday cardigan. My Ferry Bonnet sprang into life because I needed a portable project to take to town with me on Monday. I knitted hard on it over the weekend so that it would reach the point at which I could sit and knit among distractions without worry of anything going wrong – so I had the band knitted and the stitches picked up for the crown, and set the crown pattern by Sunday night. I love everything about this hat! The yarn is stunning, now that it is washed. 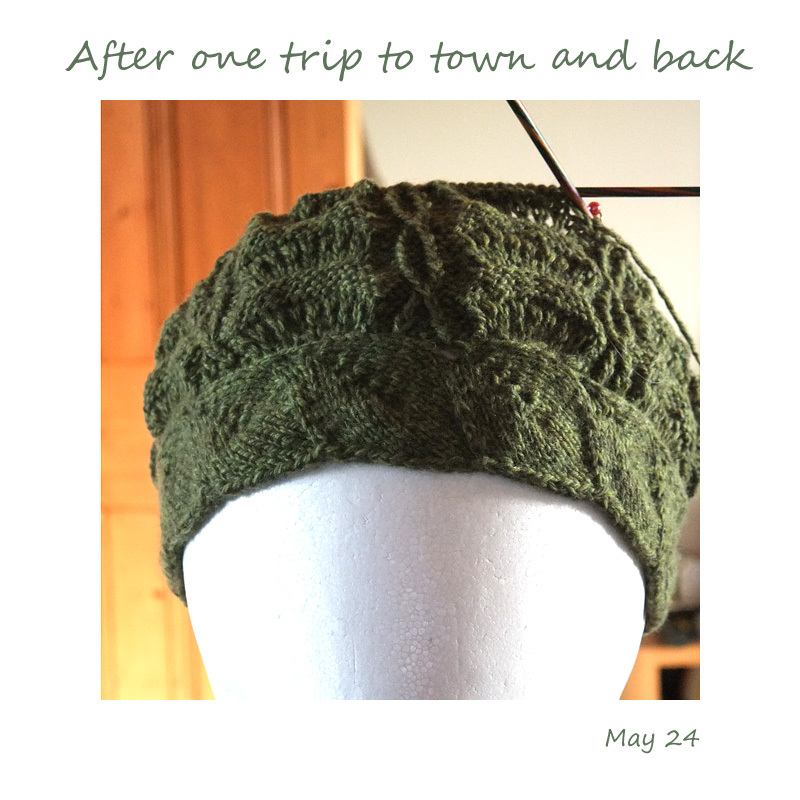 It knits up almost to a velour softness, and the shade of green is just gorgeous. The pattern is fun to knit – definitely not boring, but not too taxing either – and the resultant textures are wonderful. As for the leafy band – it is just plain adorable. Confession time: – I’m knitting on this at every available opportunity. I want to see it finished. It was supposed to go to town with me again next week, but I think I shall have to start up a new portable project before then – I’m past the half way point already. Surprised, as always, by just how much work there is in a hat – they really are not little projects at all. Have been tempted (more than once!) to make this hat less slouchy – but am steeling myself to go the whole way with it. 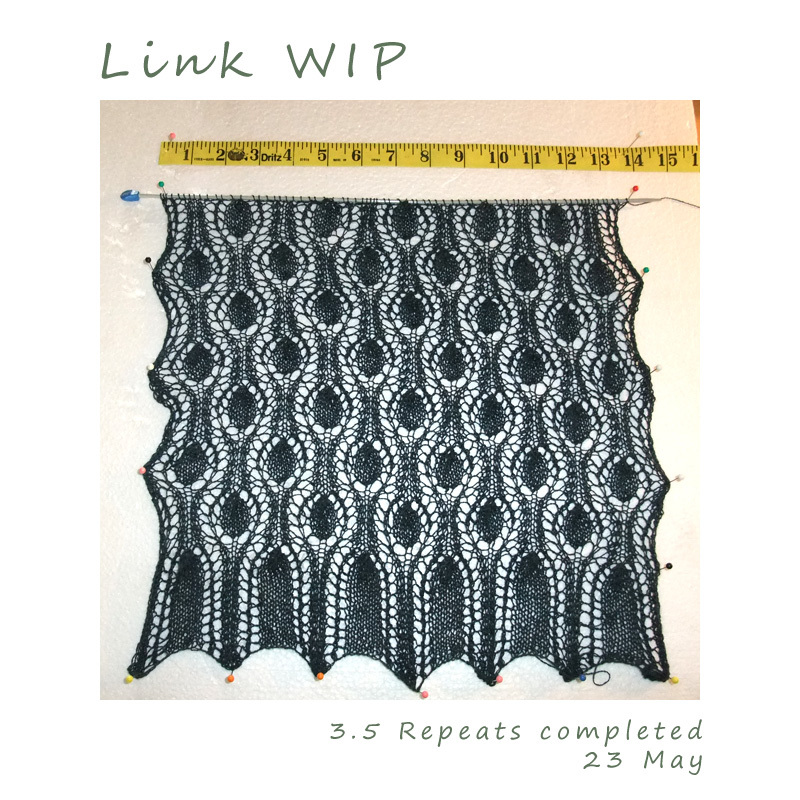 Given that I couldn’t start any of these projects until late on May 20th then I think we can say that’s a whole lot of WIP-ping for one week. But there is more. Work has been done on the Morning Surf project (no photos) and some progress made on my current weaving. That’s your lot for today – a very WIP Wednesday indeed.